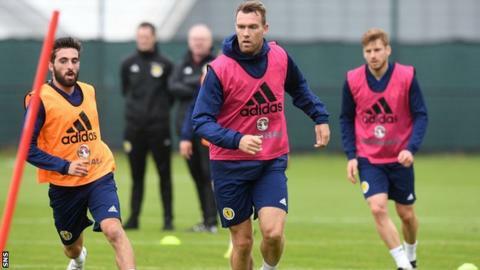 Kevin McDonald insists Friday's match against World Cup semi-finalists Belgium is not just about "making up the numbers" for Scotland. The friendly precedes Monday's Nations League opener against Albania, with Israel also in Scotland's group. The Scots have won one and lost three of their friendly games since Alex McLeish returned as national manager in February. "It's obviously a proper game," said Fulham midfielder McDonald, 29. "We're going out here to try and play. We're going to be positive and go and get a good shot against them. We're not going to be here just to make up the numbers. "We know that obviously the most important game's on Monday night. "It's the start of a new campaign for us. We've got a new squad here and it's all about getting some game-time together. "The manager's brought up a good few new players and it's all about bonding quickly and we can show we're ready. Friday night will be a time to test things out, I think." Liverpool left-back Andy Robertson, 24, has been named Scotland captain. "I think it's a good appointment," McDonald added. "He's set his standards high playing for Liverpool week in, week out. We've been watching him and he's been fantastic. "We'll all back him. To play a Champions League final, it can only be a good thing playing with these players day in, day out and you can see it on the training pitch here; he brings that into training. "He's on it every day and you can see that's a real mentality of working hard constantly at Liverpool. It's obviously paying off for them as a team and for him as an individual. He's a good lad and he's Scotland captain."